I’ve always loved burek. It was my favourite lunch treat at school. I used to have cheese burek with plain, and my best friend with strawberry yoghurt. We’d sit in the parks near our school and look at the sea. Surprised that a kid from Croatia lunches on what is by all accounts a Middle Eastern treat? Don’t be. 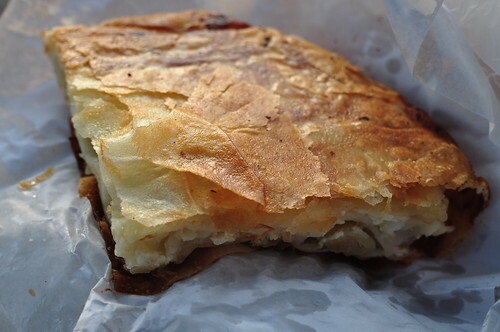 Burek is firmly part of the eating tradition in the countries of the former Yugoslavia, a legacy of the Ottoman Empire. If you are yet to be introduced to this deliciousness, burek is layers of thin thin pastry, filo-like but somewhat thicker, stuffed with a variety of fillings. Cheese, meat, spinach, potatoes – these are just some of the examples. In our parts, there is even a sweet version stuffed with grated apples, probably a playful offspring of the Ottoman burek and the Central European apple strudel. 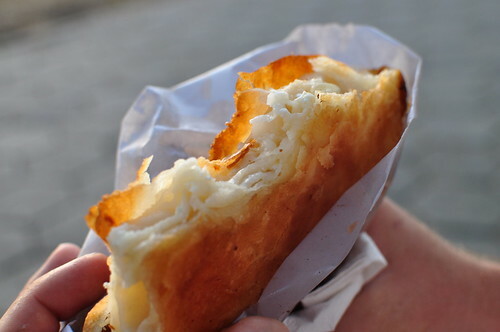 To a Croatian, a burek is any of the afore-mentioned; to a Bosnian, burek is only the one made with meat, all others are simply pies (pite, or pita singular). Here bureks normally come in coils, or layered in trays (tepsije – probably from the Turkish tepsi). In Turkey, burek or börek comes in all shapes (cigars, triangles, coils, envelopes, layered larger pies, etc. ), and is both baked and boiled. It is made with the thin yufka dough, or even with puff pastry. Jenna was an East African Asian, of Indian descent, who moved to the UK from Uganda, fleeing the bloody dictatorship of the violent dictator Idi Amin. ‘Tender and feisty’ she was, says her daughter, lovingly. I wish I had known Jenna. I hadn’t, but I got to know her through her daughter’s book, her memoir in food. In Settlers’ Cookbook, Yasmin Alibhai-Brown tells so wonderfully her mother’s story, intertwined with her own, and which forms a part of her people’s history. “Our family tree is puny, barren in large part. The roots don’t go down deep enough to produce a plenteous crop of ancestral stories or fruity relatives. The few memories hanging on are losing colour and juice, soon will wither and fall away. Every recipe in the book is interwoven in the fabric of Yasmin’s Jenna’s life, or the life of their people. Jenna’s coconut dhal has become a favourite in my home. This post has been long in making, I’m sorry to say. Hope you enjoy the recipe as much as I do. This is one recipe where mise en place is not necessarily essential. 1. Wash the channa dhal until the water runs clear. Then wash the mung and masoor dhals together. 2. Boil channa dhal for about 10 minutes, then add the mung and massor dhals, turmeric and more water, and continue cooking until the munch and masoor dhals are soft and mushy, and the channa dhal is soft. This will take about an hour in total. 3. Meanwhile, heat the oil in a pan, then add the cumin seeds, garlic and green chillies and cook until the garlic turns golden. Then add the tomatoes, the remaining 1 tsp of turmeric salt, and sugar. Cook until the oil separates, and then add chopped coriander, and cook for another 5 – 10 min. 4. When the dhal is cooked, add coconut milk to it, cook for about 5 min, and then add the tomato mixture. Cook for another 5 min to combine, and then finish off with lime juice, a pinch more of sugar, and some more salt to taste. I like my dhal rather thick, but do add some water if you’d like it soupier. Serve with rice, or bread, as a part of an Indian meal or for a simple lunch or dinner. It’s delicious either way. If you don’t have curry leaves, you can use fresh coriander in Sri Lankan Fish Cutlets. The other day, I I made the fish cakes with coriander, instead of curry leaves, and lemon instead of lime juice. I also add about a tbsp of desiccated coconut. It worked great!